Your capsule wardrobe basics should have two rules; quality and timelessness. 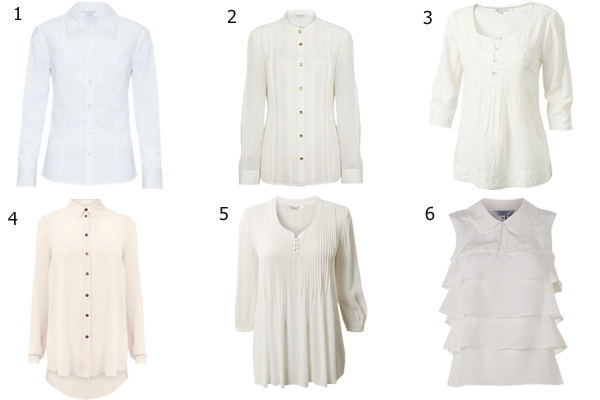 Other than that I don’t hold with the argument that every wardrobe needs a crisp white shirt, a trench coat etc, etc. And here’s my reason - If you have soft colouring and a curvy body - a crisp white shirt will set you up for a day of fidgeting and being asked if you are feeling OK. Because firstly a curvy body can’t do crisp - they need fabrics that flow over their curves and secondly someone with soft colouring looks much better in soft white rather than pure white. 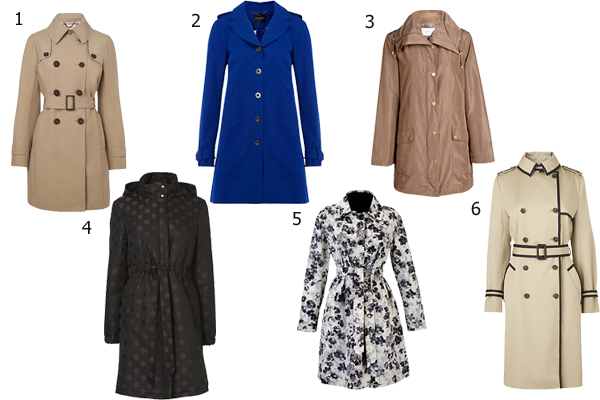 The traditional double breasted trench coat style doesn’t work on those with a full bust, so pick one that suits your colouring and your body shape – it doesn’t have to be stone or camel. 1. Crisp pure white shirt good for those with “clear” colouring, minimal curves and whose personality likes clean lines and simplicity. 2. Soft white pleated lace blouse good for all colouring and straight or curved body shape with a small bust, would suit those who like pretty, feminine and delicate pieces. 3. Soft white blouse with embroidered front suits all colouring, straight or curvy figures and those who like the natural or boho look. 4. Cream embellished cowl back shirt cream is great for those with “warm” or “light” colouring and because of it’s drape good for curves, this shirt looks perfectly innocent from the front but would be good for those who like glamour and drama as it’s got lots going on from behind! (see picture below) 5. Soft white pintuck blouse again suits all colouring, the viscose fabric and gentle pintucking would be good for a curvy figure, it’s feminine without being girly. 6. Ivory tiered ruffle blouse Ivory is good for “light”, “deep” and “clear” colouring and the shape would be best on a slim, straight figure and those who like elegance and sophistication. 2. Bright Blue Mac One way to make a statement is pick a fabulous colour like this one – but only if it suits you, which it will if you are “cool” or “clear”. The A-line shape with shoulder epaulettes would be great on a pear shape and as this colour makes a statement you won’t need to be shy and retiring! 3. Snake embossed Mac, this one is perfect for those with “warm” colouring with it’s gold trim and subtle gold snake effect, it’s also good for the fuller figure without a waist and is one for those who love a classic look. 4. Black and brown spot Mac perfect for “deep” colouring – I love the combination of black and brown which you don’t often see worn together. The drawstring is perfect for emphasising the waist and the slight sheen gives it a luxe look for those who like to be chic. 5. Floral print Mac, feminine in shape and pattern, the belted waist is great for showing off curves, this would suit most colouring except “warm”. 6. Trench coat with piping detail, for those with little or no curves this coat will give the illusion of a waist with it’s belt, this one is for you if your colouring works well with contrast – “deep”, “clear” and “cool” – and is the Mac for those who like things neat and ordered. So there you are - two key pieces of a capsule wardrobe, but done right for you. Jun 7, 2012 Does Your Wardrobe Work for you?